The ladies of the Farndale Avenue Housing Estate Townswomen's Guild Dramatic Society mount an all-out assault on the Bard with this startlingly original production of Macbeth, staged to get them to the Welwyn Garden City Local Area Drama Finals. Even though all events and circumstances conspire against the ladies of FAHETGDS on the night they're adjudicated by the curiously gregarious Mr. Peach, no amount of malfunctioning lights, mislaid props or missing actors will keep them from finishing the accursed Scottish Play. When a woman says she needs new shoes, what she really means is she wants a new job. When she says she needs a new house, what she really needs is a new husband. And when she says she wants a new car, what she really wants is a new life. One night, by chance, she is offered the opportunity to step into another life, and she takes it. Becky’s New Car is about life, love, marriage and detours we take on the road to happiness. Paris has run off to Troy with Helen. The Achaen fleet is waiting in the straights of Aulis with its ships ready to sail after her, but they remain stranded, without so much as a breeze to fill their sails. After consulting the seer Kalchas, the Achaen leaders learn this is no fluke in the weather; it is punishment meted out by the goddess Artemis. Agamemnon, general of the army and King of Mycenae, has caused her some offense. For killing one of Artemis' sacred deer, Agamemnon will have to kill something he loves; his eldest daughter, Iphigenia. Three estranged sisters meet on the eve of their mother’s funeral. As they attempt to organize the funeral, alternative memories of their childhood wash over them and the secrets of their separate lives are revealed. Laughter and tears, memories fade, blur and persist as the sisters reminisce, watched over by the ghost of the mother to whom they are preparing to say goodbye. Engineering student Jean Fournier escapes the 1989 Montreal Massacre. But his life spirals downward as his feelings overwhelm him. His parents, Benoît and Kathleen, are put to the test as they try to help their only son find a way to cope. Playwright Colleen Murphy takes us back through the lives of the fictional Fournier family and in so doing gives a poignancy to the words, fears, and jests we share every day without knowing how significant they may become. In simple and sensitive dialogue, The December Man (L'homme de décembre) examines our feelings in times of darkness. The depth of the Fournier's love for one another will strike a universal chord. Be Our Guest as we invite you to step into the enchanted world of Broadway's modern classic, Disney’s Beauty and the Beast. Based upon the Academy Award-winning animated feature, this stage version includes all of the wonderful songs written by Alan Menken and the late Howard Ashman, along with new songs by Mr. Menken and Tim Rice. Nominated for nine Tony Awards, including Best Musical. You and your family will be thrilled by the wonder and adventure of this Tale as Old as Time. Nerd (also Nurd) Noun: A foolish or contemptible person who lacks social skills or is boringly studious. Faced with social obligations and a long owed debt, a long lost "friend" arrives for a visit and it soon becomes apparent the guest is a Nerd. One uproarious incident after another until the host starts to contemplate violence... a dire development which is staved off by a surprising "twist" ending of the Play. So you think fifty is too late to shake things up and put yourself out there? Ally doesn’t think so and if getting back in the game with bags, sags, and wrinkles isn’t enough, she dares her friends to take a chance and join her in the uncertain world of online dating. The results are hilarious and touching and might make you wonder if anyone is ever who they say they are. Playwright Liz Best gives us a heartfelt look at friendship, love, and secrets among five women who have shared everything. They prove it’s never too late to take a chance, never too late to learn from each other, and never too late to surrender your heart. Meet the Mercer family, dealing with the emotional and political decisions that the characters must come to as Newfoundland joins Confederation on April Fool’s Day of 1949. As recent immigrants to Toronto, the members of the Mercer family see this event both as a new future and as a loss of Newfoundland’s culture and independence. This Canadian Classic will be playing over the 70th Anniversary of this historical event. Gardner and Fanny Church are preparing to move out of their Beacon Hill house to their summer cottage on Cape Cod. Gardner, once a famous poet, now is retired. He is living with progressing dementia as his wife Fanny valiantly tries to keep them both afloat. They have asked their daughter, Mags, to come home and help them move. Mags agrees, for she hopes as well to finally paint their portrait. She is now on the verge of artistic celebrity herself and hopes, by painting her parents, to come to terms with them and they with her. Here come the Brides! Hysterically-funny, a wildly turning and unexpectedly touching slice of small town life that boils over with riotous, prenuptial shenanigans. Talk about marital mayhem as new-found relationships emerge in this hilarious look at small town weddings gone wrong. LCP is proud & honoured to be hosting the Amateur Premier of this amazing, new comedy. London 1913. Militancy in the Suffragette Movement is at its height. Women of all classes stand, fight, and serve time side-by-side in their struggle to gain the vote. In between the forced feedings and guard brutality of Holloway Prison, Lady Celia Cain meets the young seamstress Eve Douglas, and their lives on the outside will never be the same. With Europe on the brink of war and emancipation almost in sight, the women of London refuse to sit down and behave. Based on the Apocryphal tale “Susannah and the Elders", the opera is set in the 1950's backwoods of Tennessee and centres around 18-year-old Susannah. The innocent Susannah faces hostility from the women in her community for her beauty and the attention it attracts from their husbands. She also catches the eye of newly-arrived Reverend Olin Blitch, whose influence will ultimately lead Susannah and this community to tragedy. Sixty years after its creation, the stunning music and moving story of Susannah continues to be incredibly poignant. 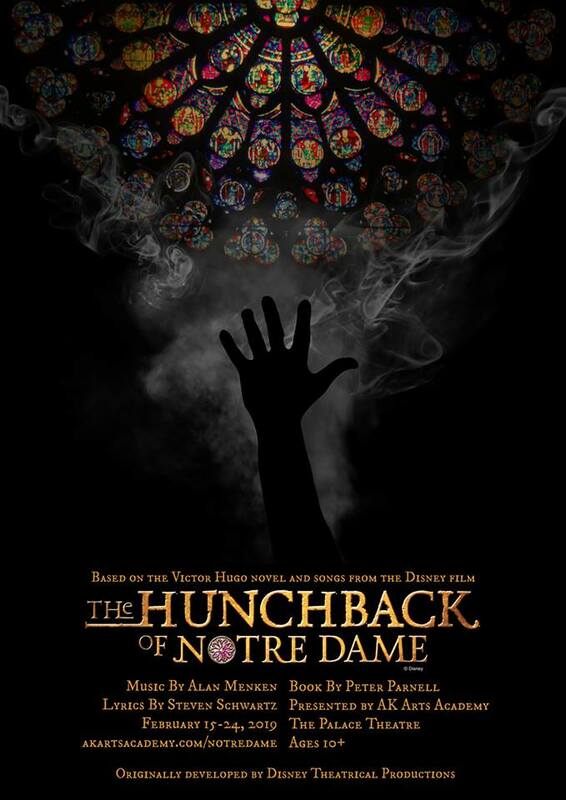 Based on the Victor Hugo novel and songs from the Disney animated feature, The Hunchback of Notre Dame showcases the film’s Academy Award-nominated score, as well as new songs by Menken and Schwartz. The characters we all know: the beautiful gypsy Esmeralda, Quasimodo the deformed Bell Ringer with a heart of gold, the handsome Captain Phoebus, Frollo, and the evil cardinal... all brought to life in this magical production. Based on the iconic 1969 rock concept album, The Who's Tommy is an exhilarating story of hope, healing and the human spirit. The story of the pinball-playing, deaf, dumb and blind boy who triumphs over his adversities has inspired, amazed and puzzled audiences for more than forty years.